The Machine Listening Lab at Queen Mary University of London (QMUL) would like to invite applicants for PhD positions as part of the newly funded UKRI Centre for Doctoral Training in Artificial Intelligence and Music (AIM). The AIM programme offers up to 12 fully-funded PhD studentships to start September 2019, with more studentships in the coming years. Studentships cover fees and a stipend for 4 years. The QMUL Machine Listening Lab (MLLab) has had great success in research papers accepted for ICASSP 2019! ICASSP 2019 (the IEEE International Conference on Acoustics, Speech and Signal Processing) is one of the major conferences in the field, and this year will be held in Brighton, UK. In addition to this, Dan Stowell will be (with Naomi Harte and Theo Damoulas), chairing a Special Session on *Adaptive Signal Processing for Wildlife Bioacoustics*. For the session, six papers have been accepted for oral presentations. My Neural Network isn’t working! What should I do? 2018 has been a fascinating year for the Machine Listening Lab. Here are the headlines! Emmanouil Benetos is co-investigator (Co-I) for the Science Foundation Ireland funded PhD project “Data-driven quality prediction for digitally restored audio archives”, with Dr Andrew Hines (UCD, Ireland) as PI. The project includes an “enrichment” year at The Alan Turing Institute, supervised by Emmanouil Benetos. Budget: €166,544. Duration: 09/2018 – 08/2021. Dan Stowell received £3,000 from The Alan Turing Institute towards the organisation of the 2nd International Workshop on Vocal Interactivity in-and-between Humans, Animals and Robots (VIHAR 2019), taking place on 29-30 August 2019 in London, UK. Helen L. Bear received £4,717 from the QMUL-EPSRC Flexible Innovation Starter Fund towards accelerating the impact of EPSRC project EP/R01891X/1. MLLab Symposium 2018: featuring an invited industrial speaker (Katerina Kosta, Jukedeck), 3 internal speakers, and 11 lightning talks from students and postdocs. There were 42 attendees including MLLab members, interested people from around QMUL, and a collaborator visiting from Brazil (Rodrigo Schramm). 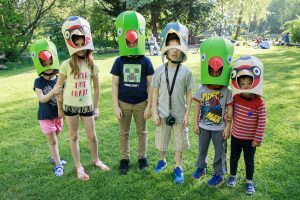 SoundCamp 2018: Animal Diplomacy Bureau, an art/design/public engagement commission by Kaylene Kau for Dan Stowell’s research project. 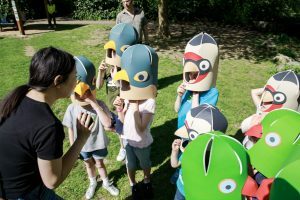 Lots of members of the public, adults and children, engaged with bird sounds and birds’ lives in a park in South London. MLLab students helped make this a success: Will Wilkinson, Veronica Morfi, and Sophie McDonald. QMUL Festival of Ideas, a group of MLLab academics and postdocs got together to play FolkRNN tunes from Bob Sturm’s algorithm. 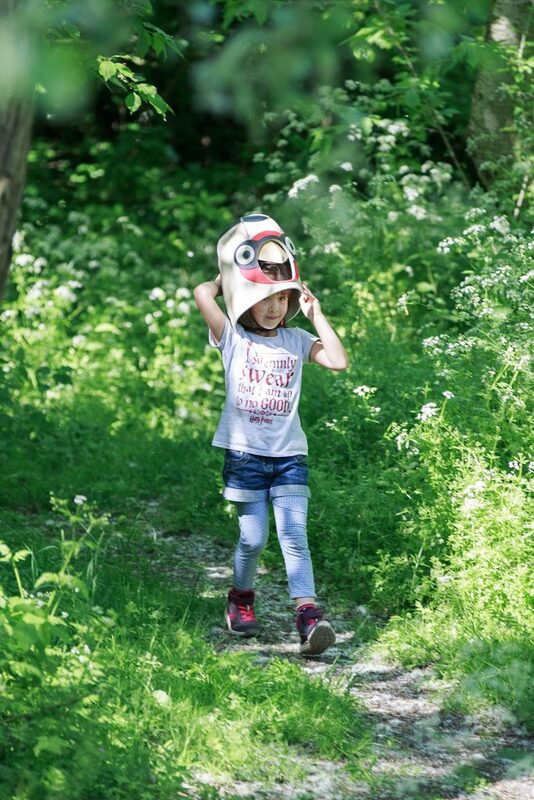 The second Bird Audio Detection challenge took place in Summer 2018: a data challenge lead-organised by Dan Stowell. Thirteen teams from around the world took part, and the highest-scoring systems represented a dramatic improvement on the state of the art. Emmanouil Benetos was Programme Co-Chair for the 19th International Society for Music Information Retrieval Conference (ISMIR 2018). Dan Stowell announced a Special Session on “Wildlife Bioacoustics and Adaptive Signal Processing”, to happen at the ICASSP 2019 conference. He will chair it together with Naomi Harte and Theo Damoulas. Dan Stowell and Emmanouil Benetos were awarded Turing Fellowships from The Alan Turing Institute (2018-2020). Emmanouil Benetos received the “Outstanding Contribution to ISMIR Award” from the International Society for Music Information Retrieval (Oct 2018). Emmanouil Benetos was promoted to Senior Lecturer (Oct 2018). Emmanouil Benetos received a “Research Performance Award” from the Faculty of Science & Engineering of Queen Mary University of London (Jan 2018). We said farewell to Bob Sturm – a founding member and co-leader of the MLLab, he has now moved to Stockholm to take up a position as Associate Professor at KTH. Congratulations to MLLab PhD student Maria Panteli, who successfully defended her PhD on Computational Analysis of World Music Corpora (April 2018). Yogi (Helen L.) Bear, post-doctoral research assistant working with Emmanouil Benetos on his EPSRC First Grant project on computational sound scene analysis. Lies Zandberg, post-doctoral research assistant working with Rob Lachlan and Dan Stowell on the BBSRC project “Machine Learning for Birdsong Learning”. Inês Nolasco, research assistant (and former MSc student) working with Emmanouil Benetos and Helen L. Bear on beehive sound analysis and taxonomies for sound scenes. Emir Demirel, PhD student working on representation learning in singing voice. Carlos Lordelo, PhD student working on automatic instrument recognition and separation. Arjun Pankajakshan, PhD student working on computational sound scene analysis. Vinod Subramanian, PhD student working on robust deep learning for music information processing. Dan Stowell joined PeerJ Computer Science as an Academic Editor. Dan Stowell gave the invited opening lecture at the 2018 Intelligent Sensing Summer School (video online here), and an invited talk at Silwood Park (Imperial College London). Emmanouil Benetos gave a keynote on “Automatic transcription of world music collections” at the 8th International Workshop on Folk Music Analysis, Thessaloniki, Greece, June 2018. Emmanouil Benetos gave an invited talk on “Automatic Music Transcription: Representations and Categorical (mis)Conceptions” at the 5th International Conference on Analytical Approaches to World Music, Thessaloniki, Greece, June 2018. Machine Listening Lab researchers will be participating at the 2018 Workshop and Challenge on Detection and Classification of Acoustic Scenes and Events (DCASE). The workshop, which is at its third iteration, is taking place on 19-20 November 2018 in Surrey, UK, and aims to provide a venue for researchers working on computational sound scene analysis to present and discuss their work. The challenge, which is at its fourth edition, continues to support the development of computational sound scene analysis methods by comparing different approaches using common publicly available datasets. In addition, Dan Stowell is the lead organiser of DCASE Challenge Task 3 which is all about bird audio detection. The challenge made use of data from collaborators all around the world, and 13 teams participated. Dan will be presenting the overall results of the bird audio detection task. See you all in Surrey! Wildlife bioacoustics is witnessing a surge in both data volumes and computational methods. Monitoring projects worldwide collect many thousands of hours of audio each [1,2,3,4], and computational methods are now able to mine these datasets to detect, isolate and characterise recorded wildlife sounds at scale [2,5]. Such bioacoustic data is crucial for monitoring the rapid declines in many wildlife populations , as well as advancing the science of animal behaviour. sound source separation and localisation in complex wildlife sound scenes. These problems must be solved in order to bring the data fully to bear on urgent global issues such as the loss of animal habitats. New methods come from machine learning and advanced signal processing: matrix factorisations, deep learning, Gaussian processes, novel time-frequency transforms, and more. These new methods have been shown to be useful in various projects, across many species – bird, bat, cetacean and terrestrial mammals. However, much of this happens in isolated projects and there is a need to bring together lessons learned and establish state-of-the-art methods and directions for the future of this field. The topic of computational wildlife bioacoustics is growing but lacks any dedicated conference or workshop. ICASSP is an ideal event through which to strengthen the application and the development of signal processing work in this increasingly important domain. Full papers (4 pages, with an optional 5th page of references) should be submitted via the ICASSP special session submission system. The deadline is the same as for other ICASSP papers (Oct 29th 2018). The review process and the quality threshold for acceptance will also be the same. For template and formatting information, please see the paper kit. Dan Stowell is Senior Researcher at Queen Mary University of London. He co-leads the Machine Listening Lab at Queen Mary University of London, based in the Centre for Digital Music, and is also a Turing Fellow at the Alan Turing Institute Dan has worked on voice, music and environmental soundscapes, and is currently leading a five-year EPSRC fellowship project researching the automatic analysis of bird sounds. Naomi Harte is Associate Professor of Digital Media Systems and a Fellow of Trinity College Dublin, Ireland. She is Co-PI of the ADAPT Research Centre, and a PI in the Sigmedia Research Group. Naomi’s primary focus is human speech communication, including speech quality, audio visual speech processing, speaker verification for biometrics and emotion in speech. Since 2012, she has collaborated on bird song analysis with the Dept. of Zoology in TCD. Theo Damoulas is an Associate Professor in Data Science with a joint appointment in Computer Science and Statistics at the University of Warwick. He is a Turing Fellow at the Alan Turing Institute and a visiting academic at NYU. His research interests are in machine learning and Bayesian statistics with a focus on spatio-temporal problems in urban science and computational sustainability. Lostanlen et al (2018) Birdvox-full-night: A Dataset and Benchmark for Avian Flight Call Detection In Proceedings of the IEEE International Conference on Acoustics , Speech, and Signal Processing (ICASSP), Calgary, Canada, Apr. 2018. Sullivan et al (2014), “The eBird enterprise: an integrated approach to development and application of citizen science.” Biological Conservation, vol. 169, pp. 31–40, 2014. Goeau et al (2016), “LifeCLEF Bird Identification Task 2016: The arrival of deep learning”, Working Notes of CLEF 2016, 440-449, 2016. Joppa (2017), “The case for technology investments in the environment.” Nature 552, 325-328, 2017. Two of the Machine Listening Lab’s lead academics, Dan Stowell and Emmanouil Benetos, have been awarded Turing Fellowships. The Alan Turing Institute (ATI) is a new UK national institute for data science and artificial intelligence (founded in 2015). Our university QMUL recently joined the ATI as a partner. The new QMUL Institute of Applied Data Sciences connects together QMUL’s researchers working on data science and artificial intelligence, and also acts as a conduit to the ATI. Through the Turing Fellowships, effective 1st October 2018, Stowell and Benetos plan to work with ATI partners to build on their research themes in advanced audio analysis – to analyse urban, wildlife, domestic and musical sound recordings. They will work with academic, industry and government on the effective and ethical development of technology, including the development of privacy-preserving analysis methods. 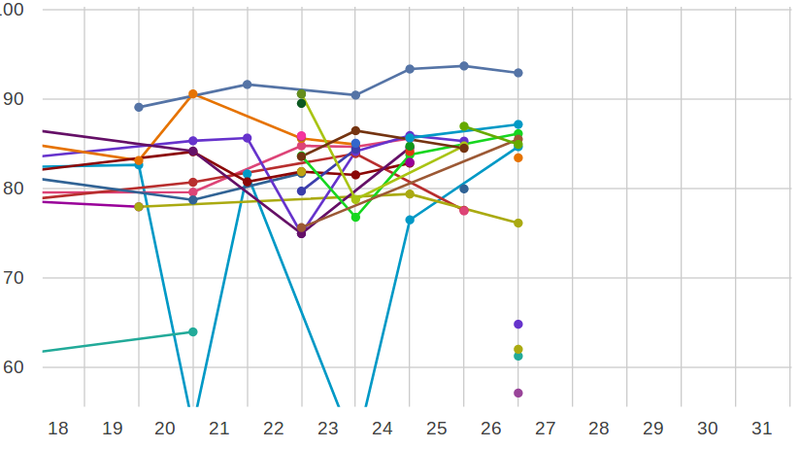 The second Bird Audio Detection challenge, now running as Task 3 in the 2018 DCASE Challenge, has been running all month, and the leaderboard is hotting up! There’s less than a week to go. Who is this “ML” consistently getting preview scores above 90%? Will this beat the system from “Arjun” which was the first to get past the 90% mark? Will someone get a final score above 90%? Above 95%? These scores aren’t just for fun, they represent (indirectly) the amount of manual labour saved by an automatic detector. If the AUC score gets twice as close to the 100% mark, this indicates approximately halving the number of false-positive detections that you have to tolerate from your system, which can thus save hundreds of person-hours in data mining, or enable some automation that wasn’t possible before. Also importantly, what are the advances in the state of the art that are bringing these high-quality results? In the first Bird Audio Detection challenge, which was only last year, the strongest system attained 88.7% AUC – and this time we made the task harder by expanding to more different datasets, and by using a slightly modified scoring measure. (Instead of the overall AUC, we use the harmonic mean of the AUCs obtained with each of the three evaluation datasets. This tends to yield lower scores, especially for systems which do well at some datasets and poorly at others.) Machine learning is moving fast, and it’s not always clear which new developments provide real benefits in practical applications. It’s clear that some innovations have come along since last year, for bird audio detection. 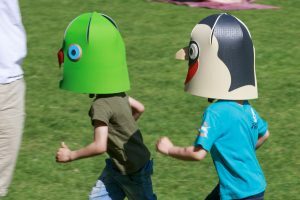 Over the recent holiday weekend, in order to spread ideas about bird sounds and ecology, we made groups of kids and grown-ups run around in a field wearing bird heads and searching for food. This was Animal Diplomacy Bureau, a game created by Kaylene Kau. Since my research fellowship is all about birds and sounds and how they interact, and the game is all about exploring those topics, I was really pleased to commission Kaylene to develop an expanded version of the game and show it as part of SoundCamp 2018. 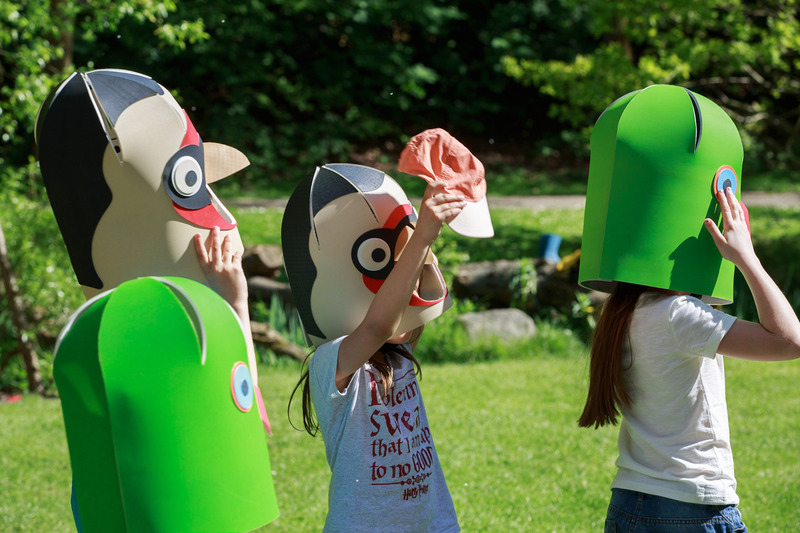 It was a glorious sunny bank holiday weekend, and the game was really popular, kids and grown-ups queueing up to play. 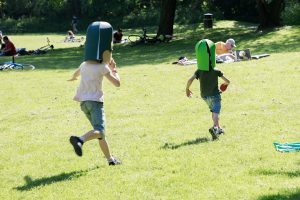 They had to find food tokens in the park while either hunting or being hunted by other species, and using the sound of bird calls as clues. The game consisted of participants taking on the role of either a parakeet, a goldfinch or a sparrowhawk while searching for red discs representing berries. The food location was indicated by recorded goldfinch calls heard nearby. The sparrowhawks had to wear small loudspeakers, which would play back sparrowhawk alarm calls giving the prey a chance to react. The prey players could resist the sparrowhawks by getting together and “mobbing” the bird, which is what many birds do in real life. After the game, Kaylene hosted discussions where she talked about how the bird species they’d been playing interact in real life, and how living in the city affects them. She invited participants to discuss what cities would be like if they were designed for animals as well as for humans. We had dozens of players, and also dozens of queries from people in the park curious to know what was going on with these bird people foraging around the place. 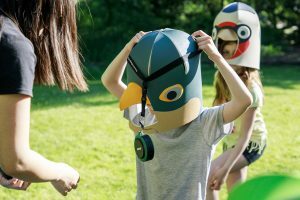 Participants went away with an inside perspective on how it is to be a goldfinch, a sparrowhawk or a parakeet in London! Thanks to my PhD students for helping Kaylene to run the event: Will Wilkinson, Veronica Morfi and Sophie McDonald.